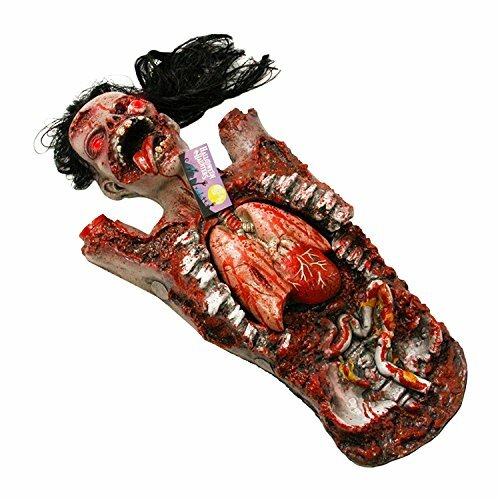 Professional high quality motion activated animatronic life-sized zombie torso with moving and pulsating beating heart and lungs prop decoration. It's made with foam filled thick rubber latex that's been gruesomely sculpted into a realistic looking tortured soul with all of his limbs severed from his torso, and the only thing remaining is his disgusting human innards. If anyone crosses this mangled zombies path the motion activated animatronics make its heart light-up and it flash, while the heart also moves up and down and pulsates like it's beating and pumping blood. While the heart and lungs are pulsating the zombie emits a loud creepy ghoulish moan as its' evil red eyes light up and flash to complete its frightening effects! Animatronic Movement: Motion activated animatronic pulsating heart and lungs. Deck out your haunted house with Halloween animatronics from Halloween Haunters! From the scariest reaper to the creepiest clowns, Halloween Haunters has amazing decor that will set your scene apart from the rest of the neighborhood. Professional high quality motion activated animatronic life-sized zombie torso with moving and pulsating beating heart and lungs prop decoration. It's made with foam filled thick rubber latex that's been gruesomely sculpted into a realistic looking tortured soul. This mutilated zombies body has had all of his limbs severed from his torso, and the only thing remaining is his disgusting human innards. If anyone crosses this mangled zombies path the motion activated animatronics make its heart light-up and it flash, while the heart also moves up and down and pulsates like it's beating and pumping blood. While the heart and lungs are pulsating the zombie emits a loud creepy ghoulish moan as its' evil red eyes light up and flash to complete its frightening effects!